How Many Miles Do I have to Run to Work Off a Burger? #Infographic ~ Visualistan '+g+"
As more and more Americans are working longer hours and have less time to cook healthy meals, they are turning to fast food to feed their families and save money. But at what cost to their health? How bad is this fast food diet that many have grown accustomed to? This infographic takes a deeper look into some of the more popular fast food offerings and how many calories they are adding to our daily diet. It even takes it one step further and breaks down the amount of exercise that is needed to burn off these high caloric food items. It is eye-opening to say the least! 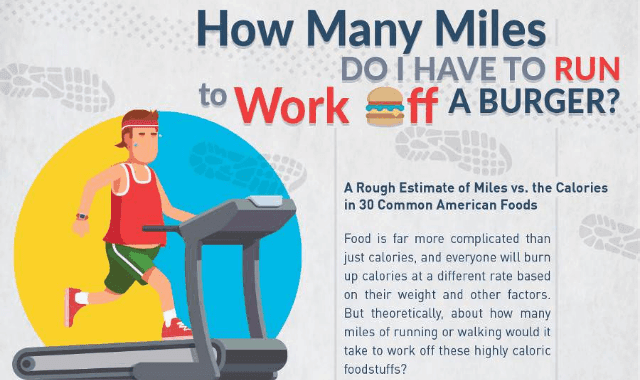 Next time you’re feeling hungry and dreaming of the drive-thru, compare the fast food treat with the amount of miles you would have to exercise to burn it off and you just might be inspired to throw on your running shoes instead.